The global active pharmaceutical ingredients (API) market is expanding due to an increase in the incidence of acute and chronic disease such as cancer across the globe. The global active pharmaceutical ingredients (API) market was valued at US$ 162,000.0 Mn in 2017. It is projected to reach a value of US$ 257,455.6 by 2026 and expand at a CAGR of 5.4% from 2018 to 2026. The global market is expanding at a relatively higher growth rate, owing to an increase in the incidence of cancer and orthopedic diseases. Active pharmaceutical ingredients (APIs) of a good quality are essential for the manufacture of effective and safe medicines. However, not all pharmaceutical companies possess in-house API manufacturing capabilities, and a single company cannot produce all the APIs required for their formulation offerings. High prevalence and incidence rates of cancers, dental carries, cardiovascular diseases, back pain, and periodontal diseases drive the active pharmaceutical ingredients market. Demand for low-cost medicines and increase in the number of ANDA filings are fuelling the global active pharmaceutical ingredients market. The global active pharmaceutical ingredients market has been segmented based on manufacturer, APIs, drug, therapeutic, and region. In terms of manufacturer, the global market has been classified into in-house API manufacturing and API contract manufacturing. The in-house API manufacturing segment accounted for a key share of the global market, in terms of revenue, in 2017. The API contract manufacturing segment is estimated to expand at a signficant growth rate during the forecast period. The segment is estimated to gain significant market share by the end of 2026. 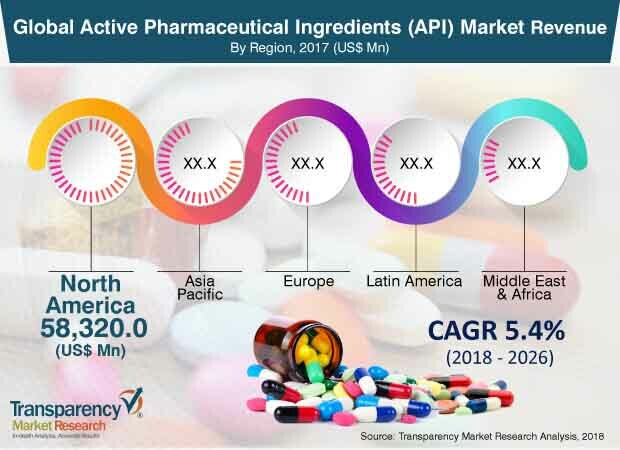 In terms of APIs, the active pharmaceutical ingredients market has been segmented into synthetic chemical API, biotech/biological API, plant extracts API, high-potency API, and classical fermentation API. The biotech/biological API segment is expected to expand at a significant CAGR from 2018 to 2026. The availability of new and innovative products in the market and increase in the preference for biotech/biological API by manufacturers are likely to propel the segment in the coming years. In terms of drug, the global active pharmaceutical ingredients market has been split into branded or innovative prescription drugs, generic prescription drugs, OTC (over-the-counter) drugs, and others. The branded or innovative prescription drugs segment accounted for a leading share of the market in 2017. Increase in demand for low-cost drugs is anticipated to boost the generic prescription drugs segment from 2018 to 2026. In terms of therapeutic, the global active pharmaceutical ingredients market has been split into anti-infective drugs, metabolic disorders drugs, cardiovascular drugs, oncology drugs, central nervous system drugs, respiratory diseases drugs, and others. Increase in cancer prevalence across the global is anticipated to drive the oncology drugs segment during the forecast period. In terms of region, the global active pharmaceutical ingredients market has been segmented into North America, Europe, Asia Pacific, Latin America, and Middle East & Africa. North America dominated the global market and is projected to lose market share by the end of 2026. The market in North America is primarily driven by a rapid increase in the incidence of cancer and diabetes and a rise in the geriatric population in the U.S.. Moreover, an increase in the demand for innovative medicine in the U.S. is projected to fuel the active pharmaceutical ingredients market in the country during the forecast period. The market in Asia Pacific is projected to expand at a rapid pace during the forecast period. In Asia Pacific, Japan dominated the active pharmaceutical ingredients market, while the market in China is estimated to expand at an exponential CAGR during the forecast period. Companies such as Teva Pharmaceutical Industries Ltd., Sun Pharmaceutical Industries Ltd., Pfizer Inc., Boehringer Ingelheim International GmbH., Merck & Co., Inc., Novartis AG, F. Hoffmann-La Roche Ltd., and Bayer AG accounted for a major share of the global active pharmaceutical ingredients market in 2017. Teva Pharmaceutical Industries Ltd. is a key producer of generic medicines and a recognized leader in innovative and specialty pharmaceuticals worldwide. Approximately 1,000 customers in over 100 countries use Teva’s active pharmaceutical ingredients (API). The company delivers high-quality and patient-centric health care solutions across the globe. It has a wide generic product portfolio, with more than 1,000 molecules in almost every therapeutic area. It has a strong presence in the market in North America, due to its strong distribution channels in the region. Novartis AG is a global health care company that develops and provides solutions to the changing needs of patients worldwide. Novartis received 16 approvals, made 16 submissions, and received six breakthrough therapy designations from the FDA in 2017. Companies are adopting the strategy of acquisitions and collaborations with parallel companies in order to improve and strengthen their geographic presence in the global market.